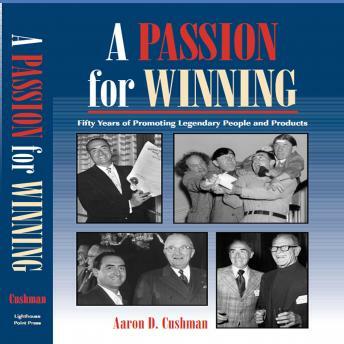 A Passion for Winning tells the story of Aaron Cushman as he lived the ""American Dream"" - from his days as a struggling World War II veteran to his establishment and leadership of the 25th largest public relations firm in the U.S., which successfully served an impressive array of clients, including Keebler Cookie Co., Serta Mattress Co., Marriott, Century 21 and more. Along the way, Cushman helped to promote a host of celebrities in motion pictures, television and nightclub entertainment, including the Three Stooges, Jane Russell, Sammy Davis Jr., Dean Martin and Jerry Lewis, among others. He also spent over a decade as co-owner and PR director for the Chicago White Sox under Bill Veeck's glory days, and later produced twelve World Championship Tennis tournaments. ""Whether it's sports, show business or Fortune 500 corporations, Cushman knows how to make news. His book is filled with terrific anecdotes about famous people and familiar products,"" said Irv Kupcinet, the late columnist of the Chicago Sun-Times. In this behind-the-scenes story of his fifty-year career, Cushman reveals his secret to success and how one remarkable man's creativity and integrity helped shape the PR profession.